The diversity of movements possible with the hands and fingers is immense. 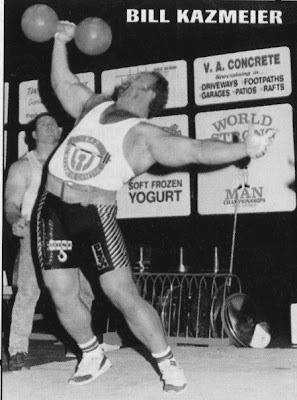 From playing the violin with the virtuosity of Itzhak Perlman to doing wrist curls with 225 lbs, and it’s all possible due to the complex anatomy of your forearms and hands. This complexity might make developing a training program a bit puzzling for some – which exercises to do and how to do them are the most important questions to answer at first. The key term to all training is SPECIFICITY – what you want to accomplish and how you’re going to train for it. Not all sports require the same kind of grip strength. Specificity of training also addresses the variables of volume, intensity and frequency. 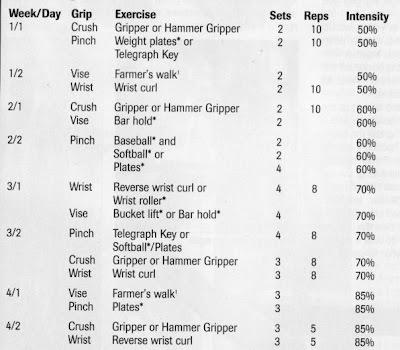 How you decide to manipulate these variables depends on what you want from your grip and forearms. Fast-twitch muscle fibers have the greatest potential for growth. Fast-twitch muscle fibers are recruited with short duration (low rep), high intensity (heavy weight) work. Some research indicates that the forearms have a 50/50 percentage of slow-twitch/fast-twitch fibers. That means you should train your forearms and grip with especially high intensity to make sure those fast-twitch fibers overwhelm the slow-twitch ones. Your body will readily adapt to the appropriate training stimulus, meaning that you can get much stronger and bigger if you train right. Now, this doesn’t mean that you should go out and start doing singles in your wrist curls, try to pinch grip a pair of 35s or hang 150 lbs. on your wrist roller right off the bat. Instead, keep your reps between 3 and 10 and, in isometric exercises like the pinch grip, keep your hold-time to about 10-15 seconds. Since you’re training with higher weights, allow for ample recuperation between grip workouts. Naturally, you’ll need to cycle your training in an attempt to move more weight because, you guessed it, a strong muscle is a big muscle. 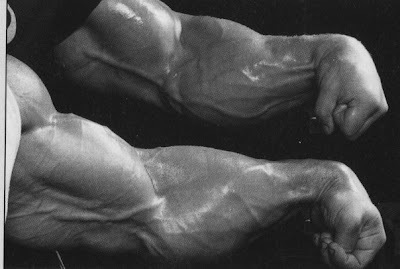 I’ve spent a considerable amount of time training my forearms and grip, and one thing I can say with a high degree of certainty is that you shouldn’t train your grip and forearms differently from the rest of your body – that goes for sets, reps, intensity, frequency and even rest periods between sets. But here’s the catch – they just don’t feel like most other muscle groups when you train them. Because you don’t get the same kind of pump and soreness and just don’t feel as exhausted afterward, it’s easy to think you should train harder and longer. Don’t! If you don’t know what your one-rep max (1RM) is on most of these exercises, simply estimate the first time around. It doesn’t really matter how accurate you are; it’s more important to simply train your grip with these different movements and learn as you go. If the intensity called for equals 80% or your 1RM, you should be able to do 5-8 reps. If you can do more or less, the weight is too light or too heavy, respectively. As far as the static exercises (shown with an asterisk*) go, look at it this way – if you can hold the contraction with a given amount of weight for a 10-count, that’s 100%. If the program calls for 89%, hold the same amount of weight for an 8-count.